Don’t use cheezy lines, they don’t work. The only good line is “Hi.” Whether it’s in the form of “Hi… I noticed you and wanted to introduce myself” or “Hi, I’m (generic name)” it is the most sincere introduction that conveys interest. There is no “pick-up artist” or “player” or man out there who knows what they are doing and can give you advice. There is a reason most players are players; they are either good looking, have a good body, have money, or they are famous. These things together, or independently, create confidence. Girls like confidence. There are way too many men trying to give advice on how to pick up a girl. 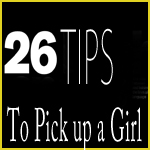 Coming from a girl who has been successfully picked up and many times unsuccessfully picked up, here is what to do. The three most important things: Eye Contact, Smile, and Charm. There is nothing more attractive than a great smile. There is nothing that draws in a girl more easily than eye contact. Being charming can step you up from a 6 to an 8 in minutes. If there is only one thing to remember, it is this: Be who you are at first meeting. If you try to be someone you are not to impress a girl when you first meet her, you will never find the right person. How many times do we hear, “He changed… He’s not the guy I met”? Do NOT try and be something you are not in an effort sew someone in. You will never be able to be yourself. And there may be another chick out there who wants to be picked up by the real you.